No-one outshines Canadian mystery writers! They are among the bestselling authors and the most widely read. Here is a second selection of my favourites. 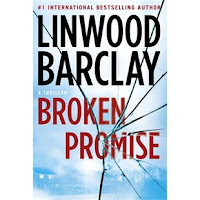 Linwood Barclay – I tell anyone who asks and some that don’t that they must absolutely read Barclay’s thriller/mystery books. He is one of those talented writers who quit his day job (as a columnist for the Toronto Star) to write full-time and he’s been churning out bestsellers ever since. I was in Toronto this summer and I was absolutely thrilled to see promotions for his latest book all over the subway. You can’t get much bigger than that! Broken Promises is his latest novel and the first in what I jokingly call a thrillergy. Peter Robinson – Robinson is originally from England, Yorkshire to be specific, and has been in Canada for a number of years. He is a Canadian citizen, is married to a Canadian and he’s been firmly adopted by us, especially the many fans of his mysteries. 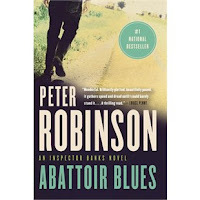 Robinson is best known for his Inspector Banks series and Abattoir Blues is the 22nd installment. Fans of his mysteries were treated to a great reading from Abattoir Blues at Keshen Goodman a few days ago where Robinson shared stories about his writing, his time in Yorkshire that inspires his work, and behind the scenes with the DCI Banks series produced by ITV. The story begins with a stolen tractor, hardly a job for DCI Banks and his Homicide and Major Crimes team, but the new police commissioner has put rural crime high on her agenda. At the same time, an apparent crime scene is discovered in an old hangar at an abandoned WWII airfield. In addition, two local lads are missing. Just as Banks and his team are getting a grip on all these incidents, a car accident in a freak hailstorm turns up a gruesome discovery. 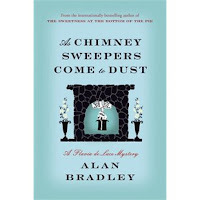 Alan Bradley – Bradley is the creator of the wonderful Flavia de Luce mystery series set in post World War II England. Flavia lives in an old, mostly rundown family home called Buckshaw. She and her two sisters Ophelia (Feely) and Daphne (Daffy) live with their father who is still very much in the grips of grief after losing his wife shortly after Flavia’s birth. When we meet Flavia she is a precocious young amateur chemist with a taste for solving mysteries and a keen interest in poisons. Conveniently, her great uncle Tarquin left a chemistry lab virtually untouched and Flavia has made it her own. When we meet up with Flavia again in As Chimney Sweepers Come to Dust she is making her way to Canada where inevitably mystery will catch up with her. "Hard on the heels of the return of her mother's body from the frozen reaches of the Himalayas, Flavia, for her indiscretions, is banished from her home at Buckshaw and shipped across the ocean to Miss Bodycote's Female Academy in Toronto, her mother's alma mater, there to be inducted into a mysterious organization known as the Nide. No sooner does she arrive, however, than a body comes crashing down out of the chimney and into her room, setting off a series of investigations into mysterious disappearances of girls from the school."--Goodreads. Robert Rotenberg – Rotenberg is not as prolific as some of the others mentioned previously but he still provides quality if not quantity. The Toronto lawyer and writer has had many adventures in his life including being a cab driver, doing a Masters degree at the London School of Economics, working for a year as a film executive, spending a year as a producer at CBC Radio, and finally returning to the Bar when money and other options ran out. My favourite thing about his books, besides the great plots and twists and turns, is the setting. 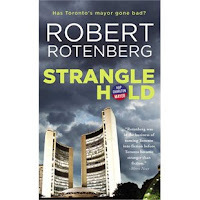 Toronto is my favourite city in this country and it is a great backdrop for the Ari Greene novels penned by Rotenberg. His latest is Stranglehold featuring Detective Ari Greene in the fight of his life. It is just after Labour Day and the city is kicking into gear. All eyes are on the hotly contested election for Toronto’s next mayor and crime is the big issue. Greene is no stranger to the worst of what the city has to offer, but even he is unprepared for what happens next when he stumbles upon a horrific homicide. gripping mystery set on the streets and in the courtrooms of Toronto, capturing audiences with his masterful knowledge of the intricacies of the criminal justice system and feel for the emotions that make people tick.